We got in to Santa Fe last night, where we’re staying in a lovely 1920s era (Maybe; the question has prompted a big argument between Robin and Peggy) Pueblo style house (again, topic of some controversy) on Staab St. (pretty sure we all agree on this part). This morning I decided to forego birding and just go out for coffee and pastries for breakfast. Then I wandered around the yard a while, and Peggy asked what that bird was singing, and I allowed as how it was an Oregon Dark-Eyed Junco, but then Ebird said that was rare. 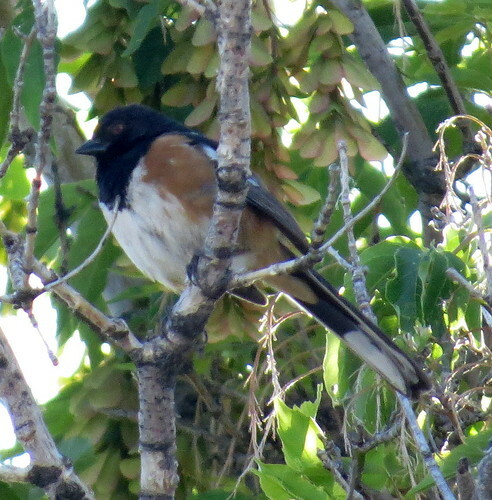 And with some embarrassment, when I looked at my photo of it I realized it was a Spotted Towhee. Oops, wrong story. So anyway, we decided to drive out to Las Vegas National Wildlife Refuge, which looked pretty good based on the ebird records. 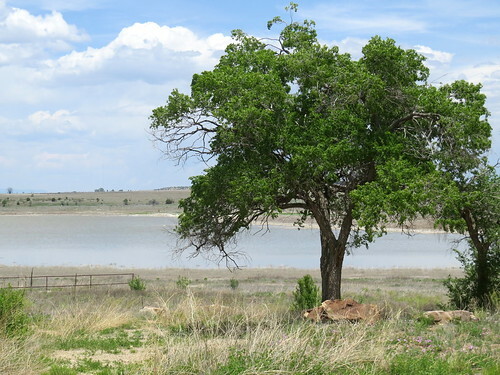 What I didn’t realize was that it’s a group of small lakes in a dry, mostly featureless grassland. 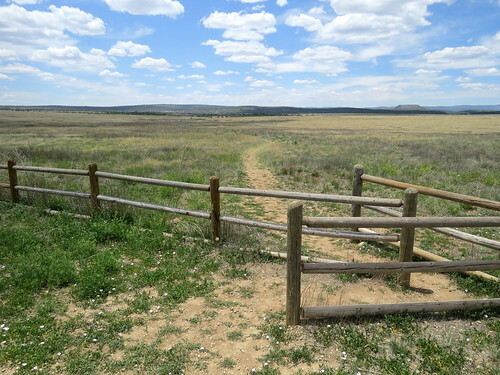 I think being there gives you a good idea what it was like on the Santa Fe trail. On the plus side, we only saw two other people and two more cars the entire time we were in the refuge. We hiked to Gallinas Canyon and back. And we used the scope to check out the lakes. They had Mallards, Coots, Gadwall, Ruddy Ducks, and a couple of Avocets. Nothing too great. 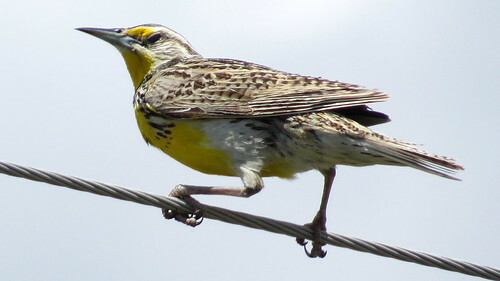 But I did get a lifer: Western Meadowlark, which was singing vociferously all over the place, and thus distinguishable from Eastern. Because damned if I can tell whether the malar stripe is yellow enough. 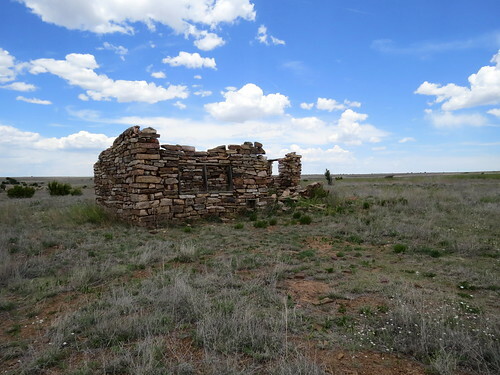 Gallinas Canyon has some cool old stone ruins. On the way back I almost stepped on this snake. 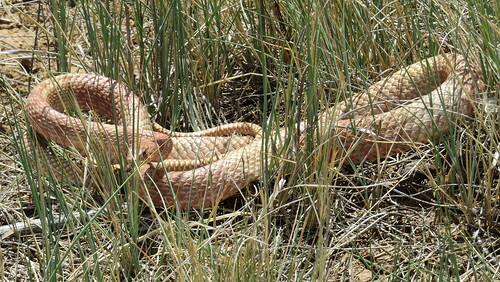 Not sure what it is; thinking maybe Western Coachwhip, but I’d be open to suggestions from people who know stuff. I could go on about the birds — we saw both Cassin’s and Western Kingbirds, for instance, but if you care you can go to the links. When we got back to the house, Hamner and I decided we should go to the store and get food for dinner, caffeine-free diet Coke, and libations. Robin particularly was enamored of Santa Sidra’s Tad Sweet cider, which she had at Fire and Hops last night with dinner. So we drove to Albertson’s where we got bread and cheese and olives and such, and some local IPA, and no cider. So we were about to head back defeated, but I decided we should try a liquor store. Which we did. No luck. 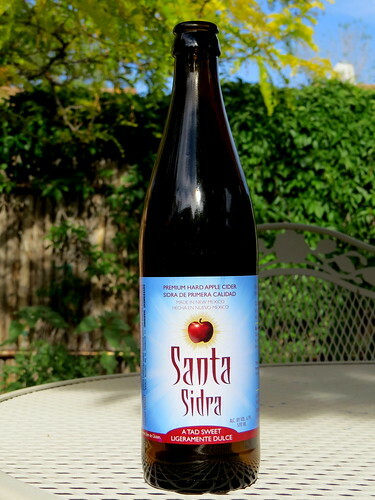 So we looked up the Santa Sidra cider brewery, and drove there. And the place wasn’t even there. So then we went to Susan’s Fine Wine and Liquors. I asked the woman there if they had local cider, and bingo! There it was. We bought a couple of bottles. She then proceeded to tell us that the owner is opening a cider brewery in Washington DC, and nobody wanted to take over his operation here, so when what they have is sold, that’s the last they’ll ever get. So we are all drinking good stuff (Hamner and I opted for Cumbre Elevated IPA) and getting ready for dinner. Tomorrow, to the Randall Davey Audubon Center (I hope). You are currently browsing the archives for the Las Vegas NWR category.